The original article can be found online at https://doi.org/10.1007/s40265-018-1036-x. The article Revefenacin: First Global Approval, written by Young-A Heo, was originally published Online First without open access. 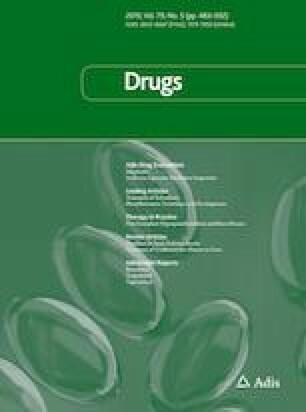 After publication in volume 79, issue 1, pages 85–91, Mylan Inc. (Canonsburg, Pennsylvania, USA) and Theravance Biopharma US, Inc. (South San Francisco, California, USA) requested that the article be Open Choice to make the article an open access publication. Post-publication open access was funded by Mylan Inc. (Canonsburg, Pennsylvania, USA) and Theravance Biopharma US, Inc. (South San Francisco, California, USA). The article is forthwith distributed under the terms of the Creative Commons Attribution-NonCommercial 4.0 International License (http://creativecommons.org/licenses/by-nc/4.0/), which permits any noncommercial use, duplication, adaptation, distribution and reproduction in any medium or format, as long as you give appropriate credit to the original author(s) and the source, provide a link to the Creative Commons license and indicate if changes were made.